If your tooth is badly damaged from injury or decay and cannot be saved, your dentist will likely recommend tooth extraction. A tooth extraction is the procedure whereby your dentist removes the damaged tooth from your jaw. After Dr. Ema recommends a tooth extraction, she will take an X-ray to develop the best personalized plan to remove the tooth. If you are having your wisdom teeth removed, we will take X-rays of your entire jaw to gauge the best removal plan, ensuring proper removal and care for the rest of your oral, sinus, and jawbone health. Your jaw isn’t large enough to accommodate more teeth. Your wisdom teeth grow in at an angle, pressing on the neighboring teeth. Or, your wisdom teeth are impacted, meaning that your wisdom teeth get trapped in your jawbone or gums. Usually Dr. Ema will look at your x-rays and determine whether your wisdom teeth will be problematic. If Dr. Ema believes that your wisdom teeth will be problematic, she will suggest extraction during your regular exam. If you are experiencing any pain, swelling, or stiffness in your mouth around where your wisdom teeth are erupting, they will need to be removed. While they are erupting, they can leave openings in your gums that leave you susceptible to infection. If the pressure from your erupting wisdom teeth is painful, it may be putting harmful stress on the surrounding teeth, causing your other teeth to move or even crack. If you have an impacted wisdom tooth, a cyst can form around the impacted tooth, which can harm the jawbone and the rest of your teeth. With all tooth extractions, you will receive anesthesia. Dr. Ema will discuss your options with you and guide you in choosing the best anesthetic option for you. With simple extractions, local anesthesia is common. At Printers Row Dental Studio, we will ensure that you do not you feel any pain during your procedure, and we always strive to make you as comfortable as possible. As with any anesthesia, you will require a ride home, as you will not be fit to drive following your procedure. Though it is common to experience pressure during the procedure, you should not feel any pain. You will experience some discomfort after the extraction, especially with surgical extractions, but NSAID (Nonsteroidal anti-inflammatory drug) pain-relievers will help to manage any discomfort. At Printers Row Dental Studio, your oral health is our top priority. 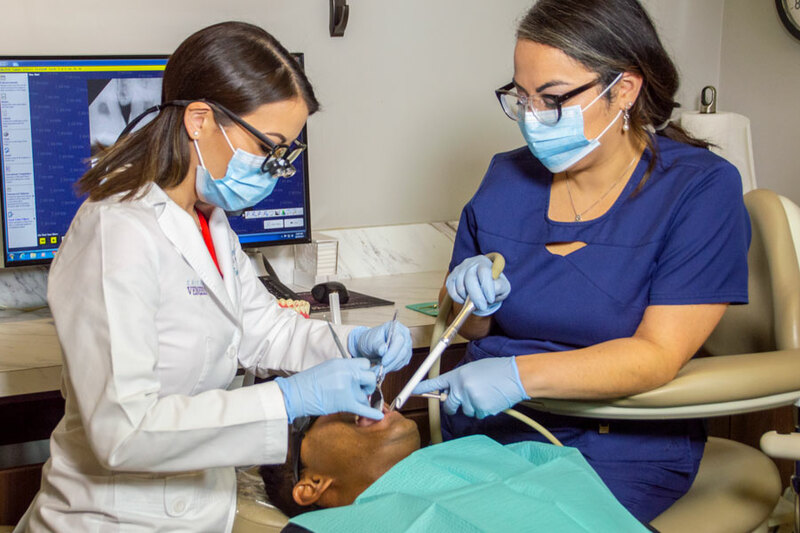 We understand how overwhelming oral surgery and tooth extractions can be, and we are here to answer all your questions about the procedure, recovery, and what to do once your tooth has been removed. At Printers Row Dental Studio, you’ll receive the high-quality and personalized dental care you deserve. Don’t let damaged teeth cause you pain and ruin your smile. If you need a tooth extraction, don’t wait any longer. Call our office today at (312) 435-0411 to schedule your appointment, or request one online.